Right whales are found in the temperate to subpolar latitudes (between 20° and 60° in both hemispheres) throughout the ocean. These whales received their name from whalers, which considered them the “right” whale to hunt because they swim rather close to shore, float when dead, and produce a large amount of oil when harvested. Today, the North Atlantic (Eubalaena glacialis) and North Pacific (Eubalaena japonica) right whales are among the most endangered of the large whales. 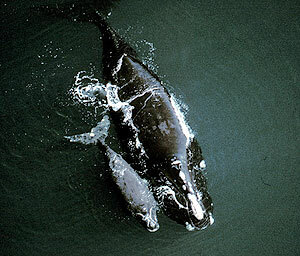 In 2004, a small population of North Pacific right whales was confirmed in the Bering Sea through acoustic monitoring. A third species, the Southern right whale (Eubalaena australis), has much higher population numbers (about 7,000 animals) than the North Atlantic (about 450) and North Pacific (less than 100) right whales. Southern right whales are also classified as “endangered” under U.S. law, but are considered a species of “least concern” on the IUCN Red List of Threatened species (North Atlantic and North Pacific right whales are listed as “endangered”). Adult right whales typically grow to 13-16 m (45-52 ft) in length and can weigh up to 70 tons (63,502 kg; 140,000 lbs). They have an extremely large head (about 1/4 of their body length) and a body that is very rounded. Their body width is often more than half of their body length. They do not have a dorsal fin and their pectoral flippers are large and broad. A right whale’s lower jaw is strongly curved in order to house their long baleen (up to 8 ft in length). The whales use their long, fine baleen to strain zooplankton (e.g., copepods) from the water as they slowly swim with their mouths open (“skim feeding”). The feature that stands out most on right whales is callosities on the head region. Callosities are hardened patches of skin that provide a home for large numbers of tiny crustaceans called “whale lice.” In Southern right whales, the callosities are also inhabited by barnacles. Callosities form in distinct patterns on each right whale’s head and scientists are able to identify individual right whales by their callosity patterns, or by scars on their body and tail. North Atlantic right whale (Eubalaena glacialis). Note the V-shaped blow above the animal’s head, characteristic for the species as it takes a breath at the surface. Image credit: NOAA. Right whales produce a variety of low frequency sounds, and the calling repertoires between the three species are considered to be similar. Moans, groans, belches, and pulses have most of their acoustic energy below 500 Hz. Some vocalizations will occasionally reach up to 4 kHz. One typical right whale vocalization used to communicate with other right whales is the “up call”. It is a short “whoop” sound that rises from about 50 Hz to 440 Hz and lasts about 2 seconds. Up calls are often described as “contact” calls since they appear to function as signals that bring whales together. Detection of up calls have been the most common means of determining right whale presence from acoustic data, and these vocalizations are widely used for monitoring and protecting these highly endangered species. Right whales also use a variety of calls when socializing in a group. The most common call recorded in surface active groups (SAGs) of North Atlantic right whales is the “scream call.” This call lasts 0.5-2.8 seconds, ranges in frequency from 400 to 3200 Hz, and is believed to be produced by the focal female in the group. Male North Atlantic right whales produce brief, intense, gunshot-like sounds that might function as a threat display to other males. Provincetown Center for Coastal Studies, Listening to Right Whales. 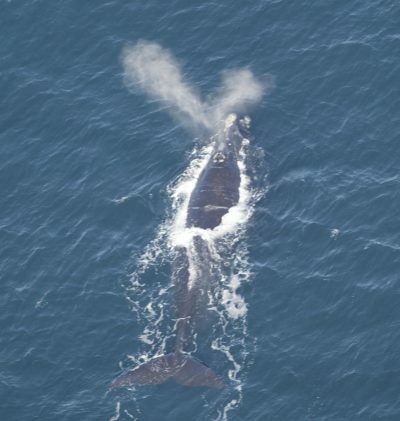 Cornell Bioacoustics Research Program, Right Whale Research.